For four decades, the World Health Organisation (WHO) has devoted substantial effort to an essential medicines programme that seeks to improve access to the most needed drugs and devices. The meeting of the 21st WHO Expert Committee on the Selection and Use of Essential Medicines will be held this week at WHO Headquarters, Geneva (27 to 31 March 2017) to revise and update the WHO Model List of Essential Medicines (EML), including Essential Medicines for Children (EMLc). The WHO EML and EMLc serve as guides for essential medicines lists developed by countries and institutions around the world. Essential medicines lists give priority status to the medicines necessary to treat a country’s most pressing public health problems. By focusing public sector medicine procurement and treatment on this limited set of essential medicines, resources can be maximised. In fact, the idea behind the lists was, and remains, that the use of a limited number of proven, essential medicines leads to better health care, improved supply, lower costs, and broader and more equitable access to products (WHO, 2002). In addition, national essential medicines lists, together with standard treatment guidelines, serve as the basis for formal education and in-service training for health professionals and for education about medication use for the public. Furthermore, essential medicines lists guide the procurement and supply of medicines for donations and local medicine production (Kar, 2010). The lists are, in short, a vital tool for improving and maintaining health. Applications to be considered by the Expert Committee for inclusion of new medicines, and changes to or deletion of currently listed medicines in the EML and EMLc, were open for public review and commentary up until 24-Feb-17. After consultation with the Secretary of the Expert Committee on the Selection and Use of Essential Medicines, and as part of the public review and commentary process, ColaLife with support from leading researchers and organisations working on issues related to childhood diarrhoea, have submitted a proposal to include co-packaged ORS and Zinc on the EMLc. 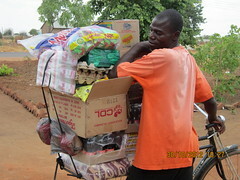 In addition, working with our partners within the Zambian Ministry of Health (MoH), we have attempted to coordinate a supporting letter from the Minister of Health, so that the Committee can get a first-hand account of the impact of co-packaging on diarrhoea treatment and coverage levels in low- and middle-income settings. Rohit spent the better half of my day at the MoH last Thursday (23-Mar-17) dotting the i’s and crossing the t’s to help push this letter through. Given that the substance of our request relates only to the addition of a packaging option, and will not constitute a medicinal change to the EML or EMLc, we hope it will be discussed and approved in Geneva this week. There is strong evidence and support to suggest that inclusion of a co-packaged kit in normative guidance such as the WHO EML and EMLc will support efforts by ministries of health and institutions around the world to increase access to these lifesaving commodities. In May of 2004, WHO and UNICEF released a joint statement to decrease diarrhoea deaths among the world’s most vulnerable children (WHO/UNICEF, 2004). This statement recommended i) low osmolarity oral rehydration salts (ORS) and ii) the introduction of Zinc Sulphate tablets for 10–14 days, as an adjunct therapy. These highly cost-effective medicines (Bishai et al., 2015; Shillcutt et al., 2016)[4,5] have been shown to be safe and effective in both home and facility settings when properly prepared and administered. Thirteen years on, and despite the evidence of benefit, of those children with acute diarrhoea, less than 1% receives Zinc and only 1/3 receives ORS globally (Gill et al., 2013). This indicates that while ORS and Zinc are listed separately on the EMLc, they will be procured separately, supplied separately, distributed separately and seldom dispensed together. Many countries, including Zambia, have changed diarrhoea management policies to include low osmolarity ORS and Zinc, but there is a gap between policy change and effective programme implementation. With 99% of diarrhoea cases globally NOT being treated with this combination therapy, it remains the second biggest infectious killer of children under 5. Stunting, for which diarrhoea is a major risk factor (13%), is prevalent in 40% of sub-Saharan African children. One recognised action to help scale ORS and Zinc, as suggested in the 2009 landmark report by WHO and UNICEF, ‘Diarrhoea: Why Children Are Still Dying and What Can Be Done’, is to deliver Zinc and low-osmolarity ORS together in diarrhoea treatment kits. This would be greatly facilitated through inclusion of such a co-packaged product on the EMLc, and evidence suggests it could be transformative in improving access and uptake. Internationally, studies have now demonstrated the advantages of co-packaging ORS and zinc in both public and private settings. In rural Pakistan, Habib et al. (2013) explored the acceptability, feasibility and impact of a ‘diarrhoea pack’ for prevention and treatment of childhood diarrhoea through a randomised cluster trial. They found a significant increase in uptake of ORS and Zinc along with a reduction in diarrhoea burden, hospitalisation, and antibiotic use in intervention clusters versus control clusters. In fact, Zinc trials in several countries have now demonstrated that promotion of Zinc can reduce inappropriate use of antimicrobials (Baqui et al., 2004; Mazumder et al., 2010)[8,9]. Other projects that have packaged ORS and Zinc together as a diarrhoea treatment kit have also demonstrated that it is an effective means of marketing these products and encouraging their combined use (Borapich & Warsh, 2010; MacDonald et al., 2010)[10,11]. In Ethiopia, Gebrehmedhin et al. (2016) explored whether co-packaging could enhance joint adherence to the recommended treatment or not. 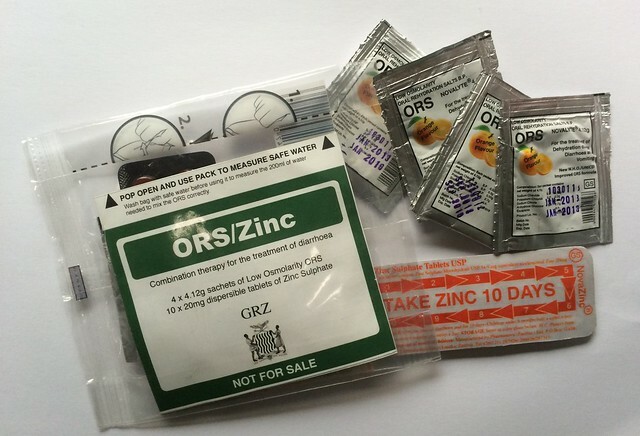 This cluster randomised control trial found that bundling Zinc with ORS using a pouch with instructional messages significantly increased adherence to the treatment by approximately fifteen percentage points compared to the status quo (separate ORS and Zinc; no co-packaging). In addition, it was found that adherence to the 10-day Zinc regimen was also significantly improved by approximately 18%-19% when comparing “bundling” arms to the status quo. Similarly, caregivers in Guatemala who received a co-pack had 1.7 times increased probability of providing the full 10 days of zinc treatment than their counterparts who did not receive co-packaged ORS and zinc (Roche et al., 2015). In April 2011, the WHO published a list of “priority medicines” for maternal and child health based on 1) the global burden of disease and 2) evidence of efficacy and safety. Hill et al. (2012) developed a study to examine the occurrence of these priority medicines on national essential medicines lists. Being listed separately, ORS were on 93% (83/89) of lists. Zinc, for treatment of diarrhoea in children, was included on only 15% (13/89) of lists. Co-packaging can create a notion that Zinc and ORS are parts of a protocol and should not be used as stand-alone products. Rather, by including a co-packaged ORS and Zinc product on the EMLc, we can help facilitate the combination therapy becoming synonymous with diarrhoea treatment. Here in Zambia, we have had our own positive experience with ORS and Zinc co-packaging as we aimed to emulate the private sector value-chains of fast-moving consumer goods by applying similar principles to the presentation and distribution of a diarrhoea treatment kit. The Kit Yamoyo, as it is locally named, demonstrated that if we can design for behaviour change, and provide citizens with the tools they need to perform the right health behaviours, and use the right treatment strategies, we can improve health outcomes. One year after introducing the co-packaged Kit Yamoyo, utilization of ORS and Zinc combination therapy increased from less than 1% to 47% in our intervention districts (Ramchandani, 2016). No change was seen in the comparators. In addition, over 90% of carers using Kit Yamoyo mixed ORS correctly, compared to 60% who used the standard 1 Litre sachets (Ramchandani, 2016). Numerous findings from this work were recently included in a key Every Woman, Every Child global publication on ORS and Zinc, entitled ‘Progress over a Decade of Zinc and ORS Scale-up’. These included the benefits of co-packaging ORS and zinc, the importance of human-centred design, localisation of manufacturing and use of existing private-sector retailers and supply chains, as well as considerations for co-packaged product design optimisation, such as smaller sachets of ORS and packaging that doubles as a measurement vessel. 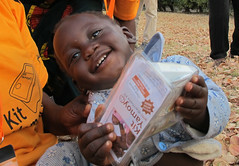 It is clear from our work in Zambia and the work of others, that as long as ORS and Zinc are listed as separate items on the Essential Medicines List for Children (EMLc) they will continue to be supplied separately and very rarely dispensed together (as per the international recommendation). While the meeting of the 21st WHO Expert Committee on the Selection and Use of Essential Medicines begins today (27-Mar-17), we will be keeping a public record of endorsements for this idea and making it available through this blog. In order to highlight your commitment to getting co-packaged ORS and zinc onto the EMLc, please send us a quick e-mail with your endorsements for inclusion on the list of supporting organisations, networks, and/or individuals, which we will share here. These endorsements will supplement the proposal/commentary under review by the committee. You can e-mail your confirmation to be added to the list of supporters to Rohit (rramchandani@jhu.edu) and Simon (simon@colalife.org) anytime this week or you can simply comment on this blog post. Kar SS. concept of Essential Medicines and Rational Use in Public Health. Indian J Community Med. 2010 Jan; 35(1): 10–13. Clinical management of acute diarrhoea (WHO/FCH/CAH/04.07). Geneva & New York: World Health Organization & United Nations Children’s Fund; 2004. Habib MA, Soofi A, Sadiq K, Samejo T, Hussain M, Mirani M, Rehmatullah A, Ahmed I, Bhutta ZA. A study to evaluate the acceptability, feasibility and impact of packaged interventions (“Diarrhoea Pack”) for prevention and treatment of childhood diarrhea in rural Pakistan BMC Public Health 2013, 13:922. Baqui AH, Black RE, et al. Zinc therapy for diarrhoea increased the use of oral rehydration therapy and reduced the use of antibiotics in Bangladeshi children. J Health Popul Nutr. 2004;22(4):440–2. Borapich D, Warsh M. Improving child health in Cambodia: Social marketing of diarrhea treatment kit, results of a pilot project. Cases Public Health Commun Mark. 2010;4:4–22. Hill S, Yang A, Bero L. Priority medicines for maternal and child health: a global survey of national essential medicines lists. PLoS One, 2012; 7(5):e38055.